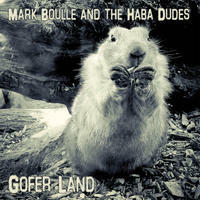 Mark Boulle and the Haba Dudes : Gofer Land. Rolling roots folk pop from the band of australian singer-songwriter mark boulle. The 6th independently produced album from the Haba Dudes is a rollicking, skanking, ballady affair. The album traverses the roots, folk and reggae realms and features Mark Boulle on guitars, keys, bass and lead vocals, Andy Woollard on drums, percussion and backing vocals, Dylan Marshall on bass, guitar and backing vocals, and Elodie Mayberry on violin, cello and backing vocals. From the grunge, reggae skank of Bad Drunk to the pirate folk song Lovin" in your Mind, Boulle manages to yet again showcase his prolific songwriting prowess. The melodic instrumentation from the band are pleasing to the ear and give the album a pop feel. To be enjoyed relaxing with a cold drink or turned up loud at a party. License Rolling roots folk pop from the band of australian singer-songwriter mark boulle by Mark Boulle and the Haba Dudes for your project. Play the music of Mark Boulle and the Haba Dudes in your restaurant or store.